Mix tomatoes (undrained) with artichokes (drained) perlini mozzarella (drained) with the cubed Italian bread in an attractive serving bowl. Eat. That’s it! No muss, no fuss! 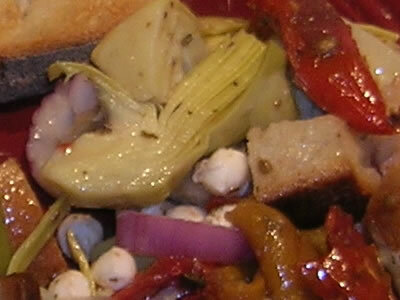 At home, I added red onion and roasted red peppers because, well… I wanted to. 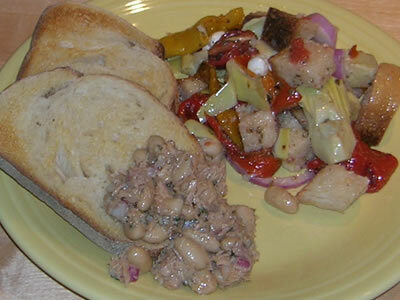 And then Victor made the most yummy Tuna and Cannellini Bean Salad to go along with it! Talk about gastronomic heaven! Drain oil from tuna into medium bowl. Add enough olive oil to measure 3 tbsp total. Add vinegar. Add onion, parsley and sage. Mix in beans and tuna. Season with salt and pepper. We served it on thick slices of toasted Italian bread. Damn, it was good! The herbs were fresh from the garden, the bread fresh and lightly toasted… Simple flavors… Ya can’t beat it! Y’all still eating that tuna and beans? Time for a change I say.